Verbringen Sie den Tag damit, Cancun kennenzulernen und Andenken einzukaufen. Diese kleine Tour ist die perfekte Gelegenheit, um die Höhepunkte der Stadt zu erreichen und die perfekten Geschenke für zu Hause zu finden. Vergessen Sie nicht, sich auch selbst etwas Gutes zu tun! Neben den Einkaufsmöglichkeiten gibt es Haltestellen an malerischen Stränden und Aussichtspunkten für Fotos. Kein Besuch von Cancun ist ohne eine Tequila-Verkostung komplett! Good tour and covers everything in the write up. The Tequila museum is more of a shop though. I really enjoyed this tour of Cancun! I wish we would have had more time in the Mall and tequila museum, but other than that it was really fun! Our driver and tour guide were very nice. We had a mixed group of English and Spanish speakers so he took his time to explain things in both languages. 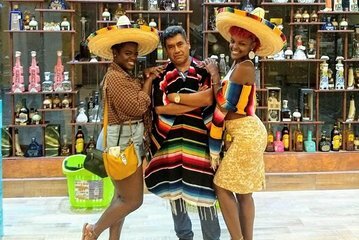 We visited 3 shopping areas, market 28 a small store, this huge flea market, and a large shopping mall with tequila museum. Also the Cancun sign. This tour was really good. The only thing I would change is the length of time given at each stop. I think each stop should have an additional 30 minutes! Tour guides were very friendly! Would definitely book again if in the area! Nice sightseeing trip of Cancun. Van was airconditioned, cold water provided! Host and driver very good! A great bargain for the price. This trip was fantastic! The guides and drivers were very professional and friendly. The vehicles were clean and well maintained. The 1st stop at Market 28 was my favorite. There were lots of small shops to buy authentic souvenirs at a decent price. The shops took USD and pesos. If I could change one thing about the tour is that I would want more time to spend here. They explained that it was for our own good as it was easy to get turned around and lost in this area. So, they were looking out for us! When it was time to leave, the bus had already been cooled off and the driver and guide provided very cold moist hand towels, it was pushing 100, so it was a nice refreshing surprise! Stop 2 reminded me more of an indoor American flea market. It was nice and clean, but the vendors sold the same stuff as Market 28 and it was a little more expensive. We were warned and it was true, the shop owners were a little more pushy here. If you are not interested, just walk away and move on. They will go to the next person walking by. I felt that we had plenty of time here and were not rushed. On the way to stop 3, the driver took us through the ever popular tourist area of Cancun and even did a loop so that we could see all of the landmarks. Stop 3 was at a very nice mall. The Tequila Museum was very interesting and did not take up nearly as much time as I thought it would. Again, we had plenty of time to shop. Before we were dropped off at our resort, we stopped to pose at the famous CANCUN sign in front of the beautiful beach. They took time for each of us to take pictures etc. I was very please with this excursion and would even do it again on our next trip. My husband who was apprehensive about shopping ended up having a great time. The guides were very knowledgeable and made it a priority to make us comfortable and have fun. I learned a lot about the Mexican culture and the local area. Thank you! !